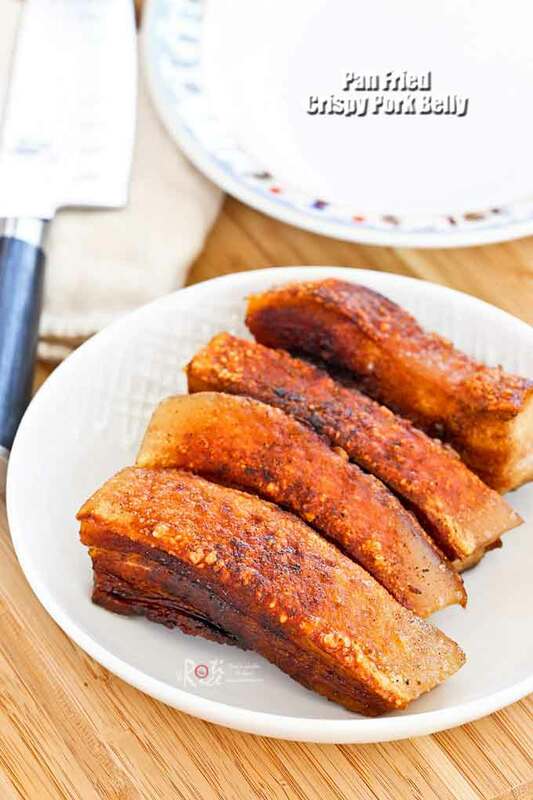 Make this quick and easy Pan Fried Crispy Pork Belly in 40 minutes. Only 4 ingredients and just as tasty as the oven roasted version. There is something about Roast Pork Belly that makes it so irresistible. Kids absolutely love it and so do they adults. 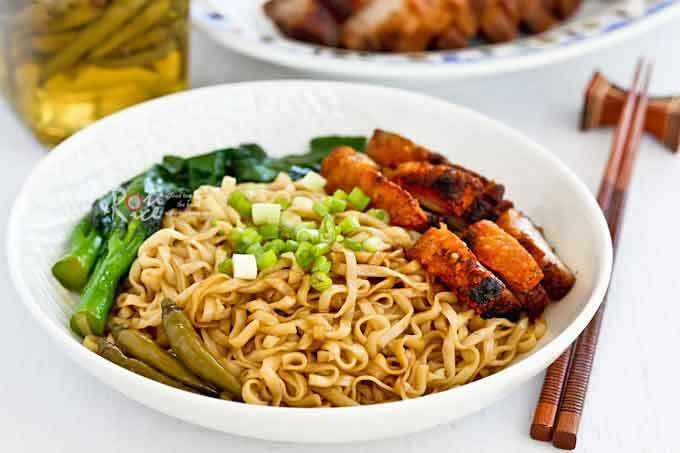 The salty meat coupled with the crispy skin make for a very tasty dish whether eaten with rice or noodles. The trick to a crackly skin is to get it really dry, hence leaving it in the refrigerator uncovered over night. This of course takes time. To speed things up, cooking it on the stove in a cast iron skillet is a good alternative. The skin may not be as light and crackly as when you place it under the broiler but it is pretty decent. The crackling will definitely be “thinner” and more “dense” simply because the skin is placed down onto the skillet as opposed to allowing it to blister under the broiler. That said, you can’t beat having Pan Fried Crispy Pork Belly in just 40 minutes! This means that you can even prepare this on a week day if the craving hits. 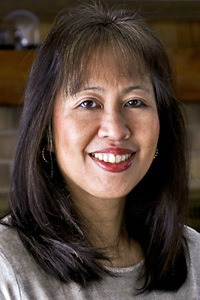 Also, the preparation is a little simpler and that is always a good thing. There is little to no difference where the meaty part is concerned. I used the same ingredients for both versions and so they should be about the same. 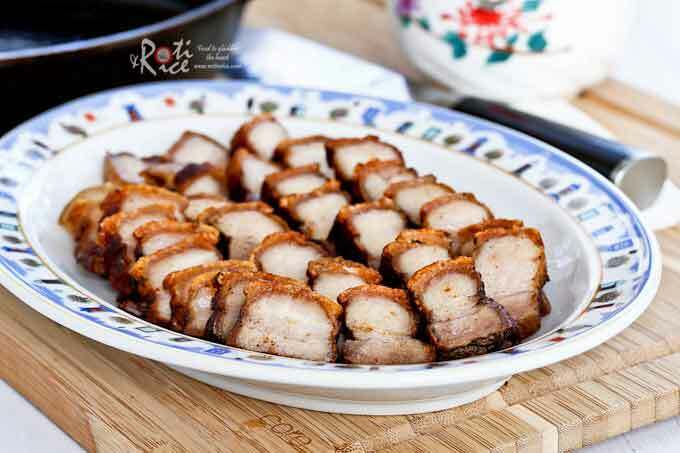 Again, if you are in a pinch, then this Pan Fried Crispy Pork Belly is the way to go. 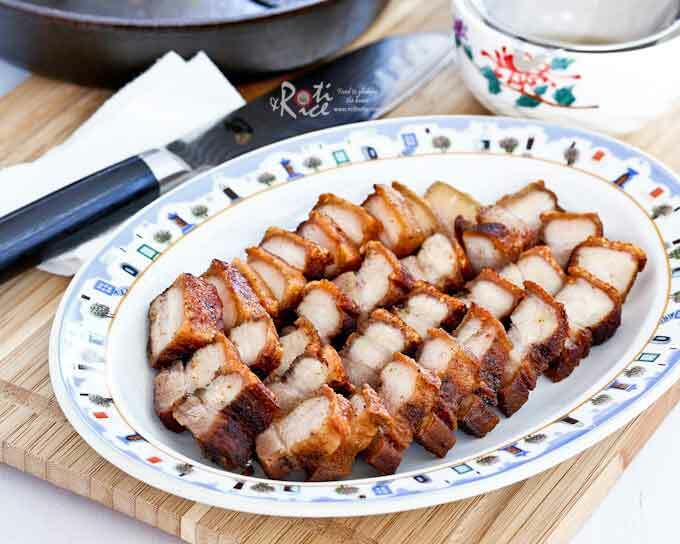 Cut pork belly into 4 strips of about 6 in x 1½ in each. Then, scrape each piece of pork belly rind with knife to remove impurities. Rinse and drain. Bring a pot of water to boil. Blanch pork belly in boiling water skin side down for 5 minutes**. Flip pork belly and allow it to blanch for another 5 minutes**. Remove and place pork belly skin side up on a tray. Combine 1 teaspoon salt, pepper, and five-spice powder in a small bowl. Pierce the pork belly skin all over with a fork. Pat dry with paper towels. Pat dry rub evenly over the meat and sides of pork belly. Rub remaining 1 teaspoons salt evenly onto the rind. Heat a cast iron skillet on the stove over medium heat. When hot, place pork belly strips on their side and cook for 5 minutes. Do the same for the other two sides. Finally, turn the pork belly strips skin side down and continue to cook for another 5 minutes. If the skin side is not flat, you may want to press each piece down with a pair of tongs so that they touch the base of the pan and sizzle. Remove and chop into smaller pieces. Serve immediately. ** Please boil anywhere between 5 to 10 minutes on each side depending on the thickness of your pork belly. 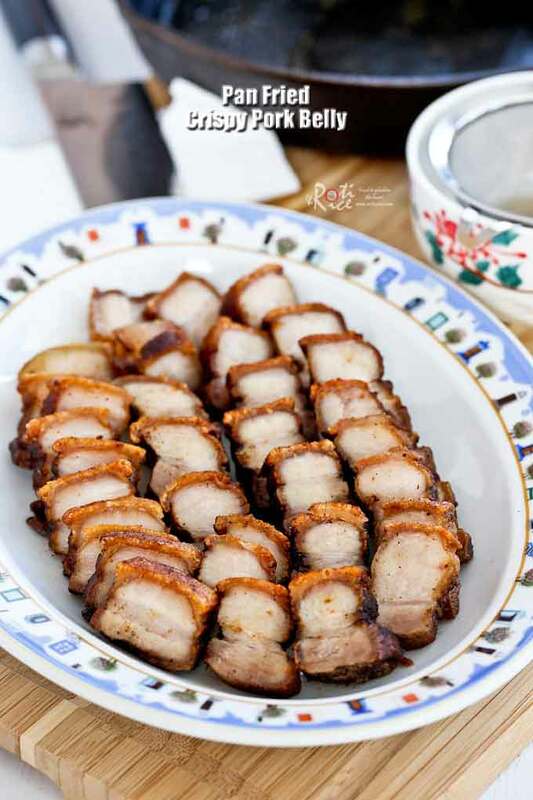 Pan Fried Crispy Pork Belly is equally delicious served with rice or noodles. I saved the pork lard rendered to make this dry style toss noodles. You can get the recipe for the sauce in this Lo Mein post. Simply replace the sesame oil with the pork lard. The noodles were super tasty served with Pickled Green Chilies.